Well, here we are again, traveling from Winnemucca, NV, to Highway 395 north of Susanville, CA, and we’ve just made it to the west end of the Jungo Road where it intersects with NV S.R. 447 (formerly S.R. 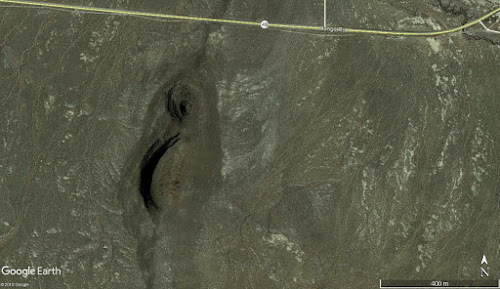 34) just south of Gerlach. You’ve probably noticed that I haven't been blogging much recently. I'm not really sure why. Sometimes the work I do takes the writing right out of me, partly because I do enough writing many days that I'm totally done with that by the end of the day; also, I don't really have much time after work before I have to do dinner, then get ready for bed—at least if I want to get enough sleep, which I do want (I don't always succeed). Another thing contributing to the recent spate of sparse blogging—besides taking care of personal things that have been taking a lot out of my energy during my days off—is that my writing effort during the fall and winter months has been going toward writing bits of fiction (a novel? ), which I've been working on intermittently during the last two years. Anyway, all of that—work, trying to get enough sleep, personal issues, and writing fictional to non-fictional stories—has placed blogging low on the list. Now I'll upload the photos for this post, and we'll go from there. Just like a real journey, we’ll see how far we get! 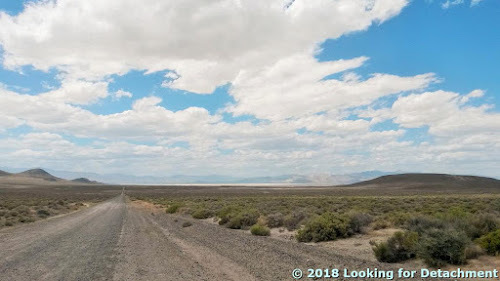 At the end of the last post, we'd driven quickly through Gerlach and had reached the northwest side of the Smoke Creek Desert. I hadn't taken any photos while zipping through Gerlach, but I often stop, and I've even stayed overnight at least twice. So let's backtrack before moving on. 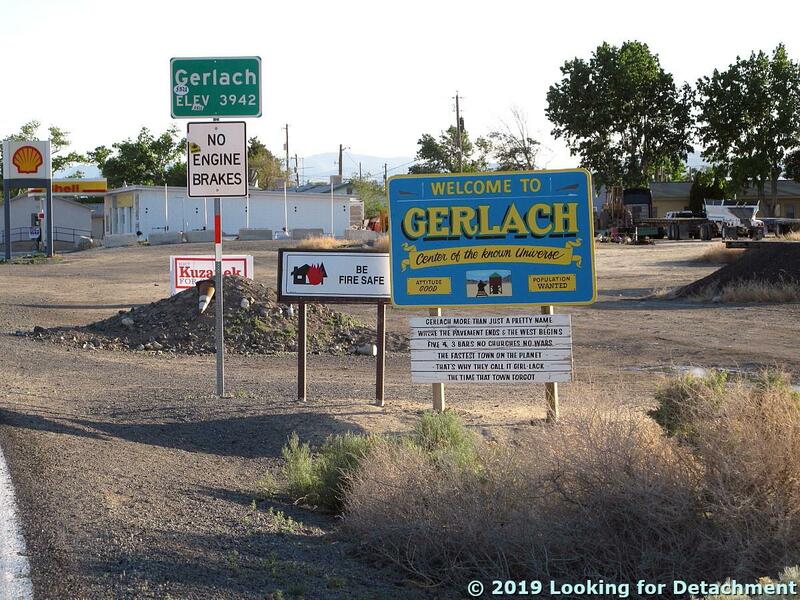 Gerlach is a small town that brags of several mottoes, including "Center of the Known Universe," "Where the Pavement Ends and the West Begins" and "The Time That Town Forgot." More can be seen on the town sign, above, or in this nicely enlarged version of the sign by the RGJ. As indicated by the sign, Gerlach is technically pronounced Grr-lack rather than the Grr-lock one hears so commonly these days. I shot these photos of Gerlach on a trip that FMOH and I took back in the spring of 2014. 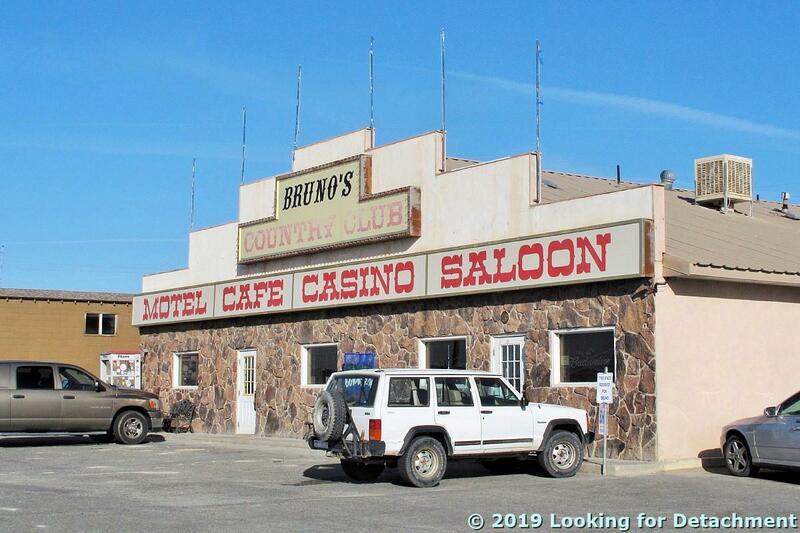 Like the June, 2018, trip that we—you and I—are reprising, he and I had just come into town from Winnemucca on the Jungo Road. We were bringing the motorcycle back from Nevada, mirroring this trip taking it out to Nevada. 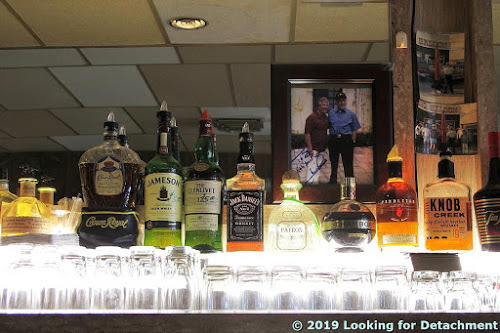 While in town, we did the usual thing of stopping to eat at Bruno's Country Club, probably getting Bruno's Famous Homemade Ravioli. By 2014, Bruno was no longer making his ravs personally, so I don't think they were quite as authentic, nor were they quite as good. Unlike many trips, this time we stopped at the bar for a couple beers; we weren't driving on that afternoon or evening, but were, rather, staying at Bruno's Motel. Bruno Selmi, the Basque owner of the cafe, bar, motel, and only gas station in town, died in May of 2017—he can be seen in the photo above the bar (the older man on the right). 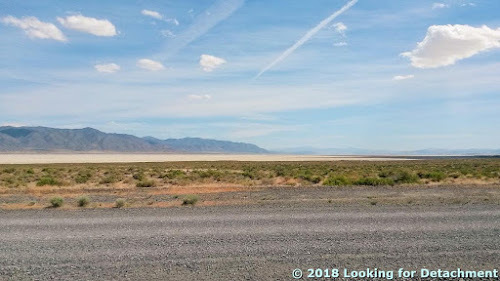 After checking in to our room at the motel—and after duly going back to the bar to get a second room when the first smelled either of gas or dead mouse—we wandered out onto the far western edge of the Black Rock Desert, where we had a view somewhat atypical of most views of the desert. This section of the Black Rock is a section you don’t want to drive into: it’s usually muddy, and it’s very possible that you’ll get stuck. 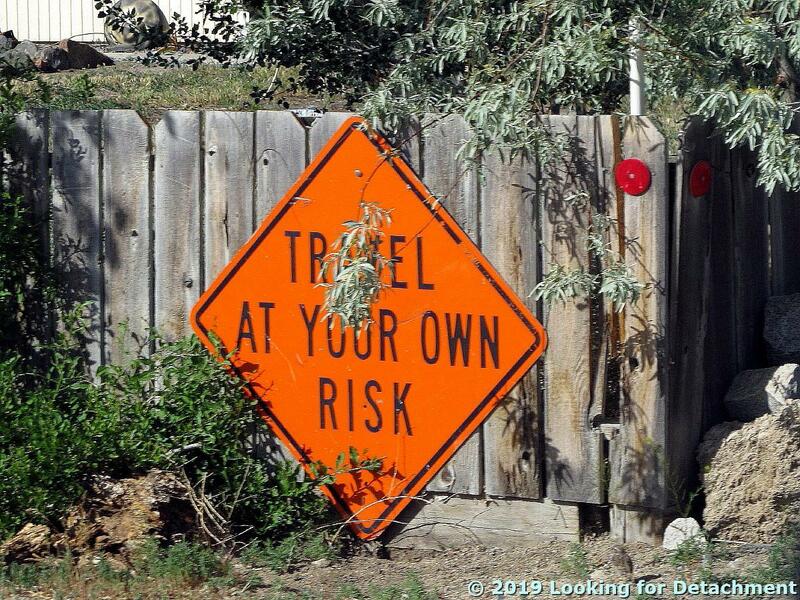 The getting stuck part typically happens at night when an unsuspecting traveler, one who is already out on the desert somewhere to the east, decides to get off the desert—and instead of driving to the usual take-out spot north of town, sets their sights on the lights of Gerlach and makes a beeline for town. The next thing our unsuspecting—or willfully ignorant—traveler knows, they are stuck, possibly axle deep, in the mud at the west end of the main section of the Black Rock Desert. Fortunately for them, they aren’t far from Bruno’s gas station. Maybe someone will risk a vehicle to come and pull them out! It’s possible one could wend their way through the merely salty white section of desert to the pavement on the east edge of Gerlach, at least in the drier years, but I don’t recommend trying it. I personally know at least one person who tried this one night back in the 1980s; the getting stuck was epic. The next morning after breakfast, FMOH and I headed west. Now let’s get back to my June 2018 trip, which I was taking all by myself (cue pint-sized pity party). 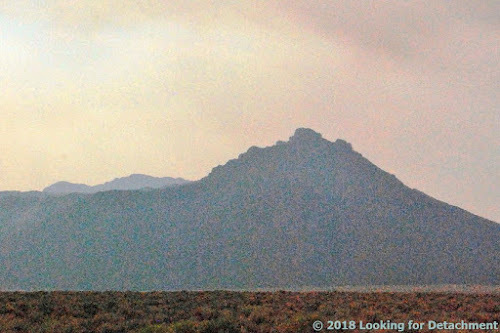 I had just made it to the northwest side of the Smoke Creek Desert and had taken the photo seen earlier and in my last post. 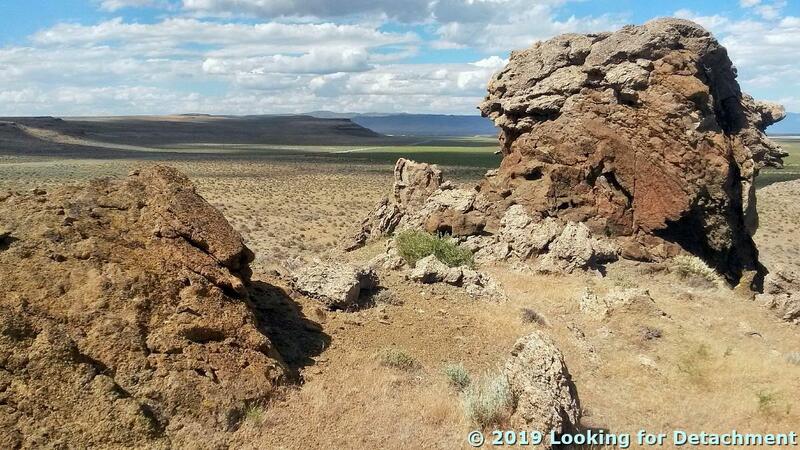 A ways farther down the west side of the Smoke Creek Desert, I pulled over for a quick examination of some tufa. There are many spots to see tufa domes, mounds, and hills along the west side of the Smoke Creek Desert; this mound, Hill 4081, was a new one to me. 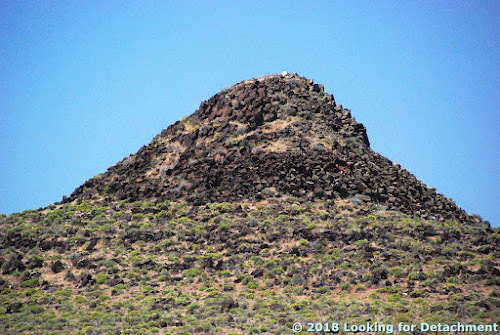 I climbed up through the cheatgrass and scattered tansy-mustard tumbleweed and looked around. Here we’re looking off to the northeast, more or less back toward the Junction of C.R. 447 and the Smoke Creek Desert Road. 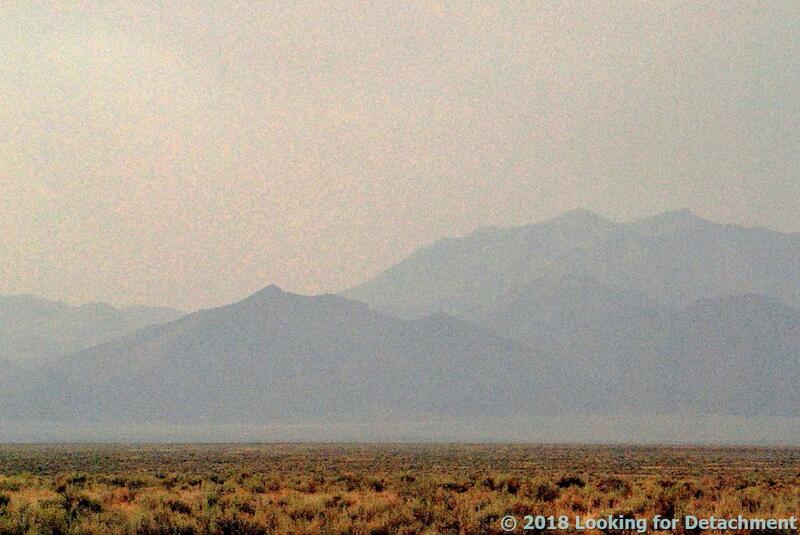 The Granite Range, unsurprisingly underlain by granite, rises steeply beyond the distant Smoke Creek Desert playa. The foreground is green because...water. It’s a wet part of the basin, possibly because of the entry of perennial Smoke Creek into the desert just south of where we’re standing. 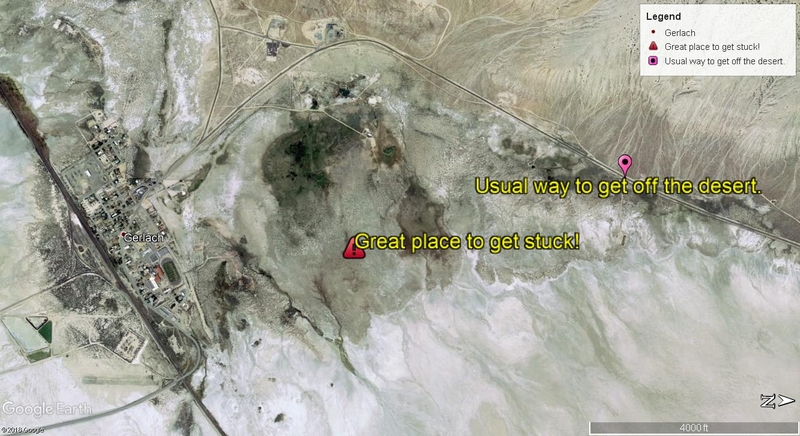 It’s also more elevated than the playa, and covered with grass (at least cheat grass) and various scrub. I love tufa mounds, so I stood looking around for a few minutes, taking lots of photos. This photo looks off more to the north. The distant bluish hills just right of the tufa dome are part of the Buffalo Hills, which are underlain by a pile of volcanic rocks. More tufa! More volcanic rocks! 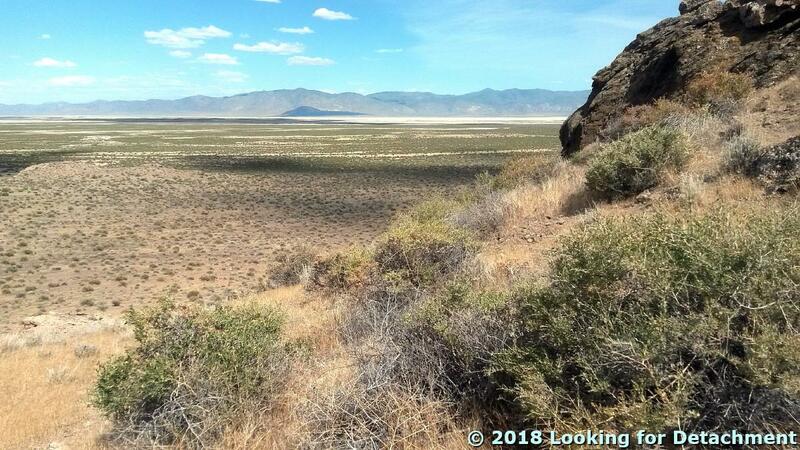 The hills in shadow between the tufa masses are some volcanic flows forming the eastern foothills of Burro Mountain. From this point on Hill 4081, I got back on the Smoke Creek Desert Road, went south a short distance, and then turned west on what Washoe County considers the continuation of the Smoke Creek Desert Road, and what Google Maps refers to as the Smoke Creek Road: a dirt road that heads west up Smoke Creek. Well, it’s taken me awhile to get back to this road trip—for various reasons, including work schedules and personal things—but I’m going to give it a try again. 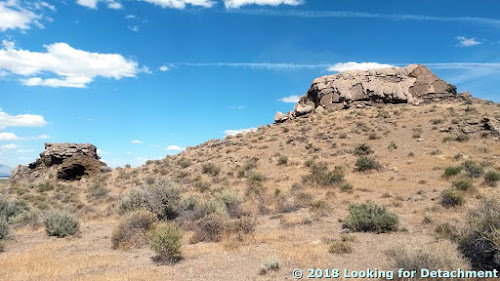 Part 1 was the July 14th post, Winnemucca to Hwy 395 north of Susanville, Part 1. Part 2, as far as distance down the road goes, was actually an earlier post about Sulphur, Things You Find in the Field: Sulfur at Sulphur, on June 19th. Also see a little about the spot we ended last time, Pulpit Rock, though I don’t have much on the geology of that geographic landmark. And I guess I should really pool some photos of mine taken of and near Hycroft’s gold mine sometime, but that would take a little more effort than I have time & energy for right this moment, so we’ll skirt past Hycroft, unless you’d like to stop at Sulphur briefly and look back, which we did on June 19th. 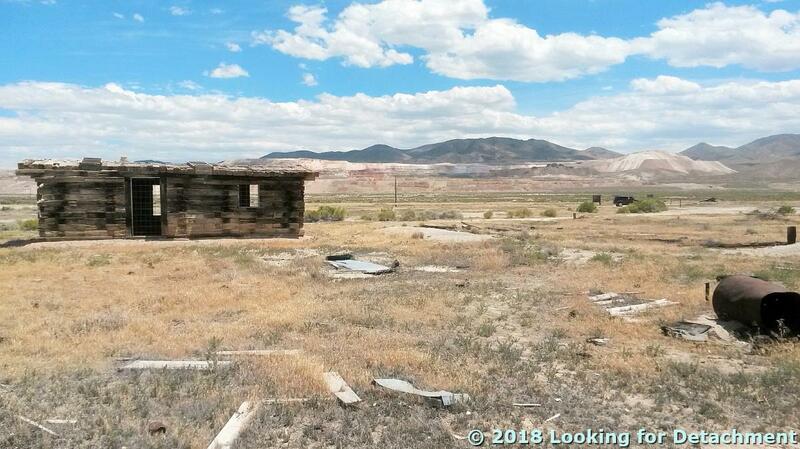 Looking east from Sulphur toward the barely active Hycroft gold mine. Anyway, we’ll proceed westward. 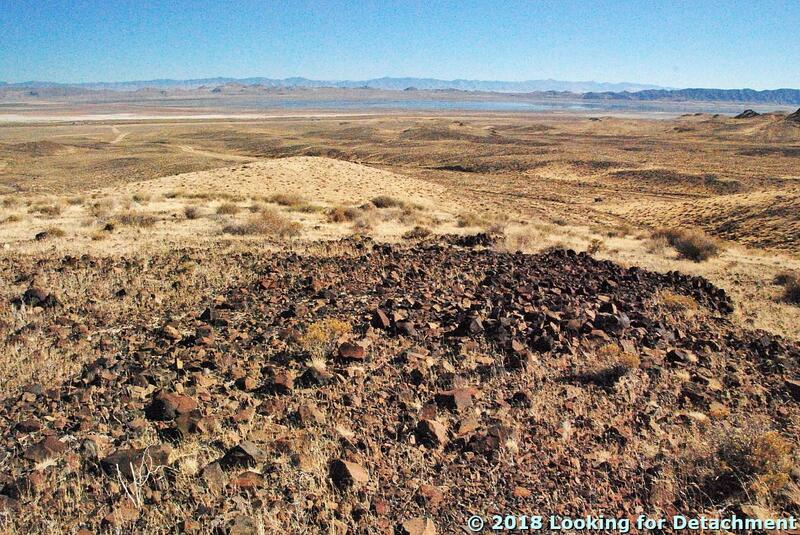 The road we’re on, the Jungo Road, would have been largely under water during the high stand of Lake Lahontan, which was in Sehoo time about 13,000 years ago. Consequently, there are several good spots along this stretch of road to see old Lake Lahontan shorelines, including the highest shoreline. And here’s one such spot. 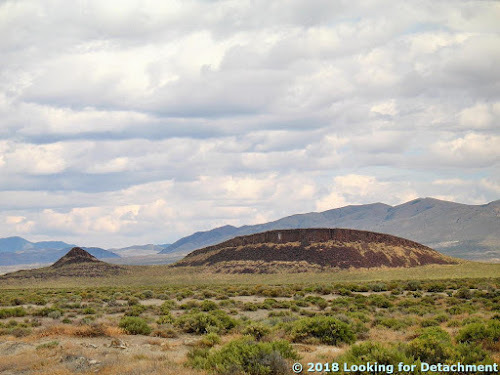 The road goes just north of an elongate, somewhat oval hill with two rocky basalt knobs that would have been two small islands when the Sehoo lake was at it’s highest. The dark, rocky horizontal lines are some of the higher old shorelines. Here’s a closer view. 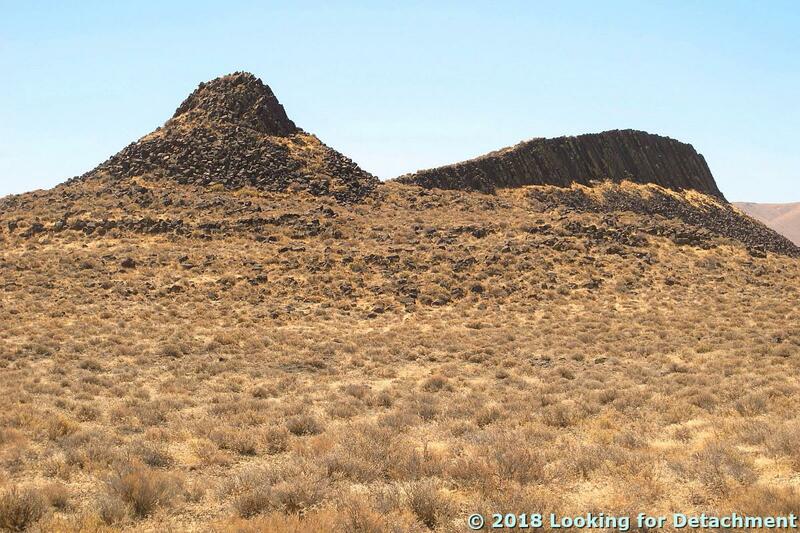 All of the upper, rocky portion of this knob was an island during the Lake Lahontan high stand. The break in slope, where the hill goes from bushy to rocky, is at about 1334 m (4377 ft). But wait, what do I see? When I zoomed way in, I could see that the back side of this knob (the east side) is formed of the tops of columns! And the rubble or talus at the base of the knob consists of broken columns! Read more about columnar jointing here at Evelyn Mervine's blog, Georneys. 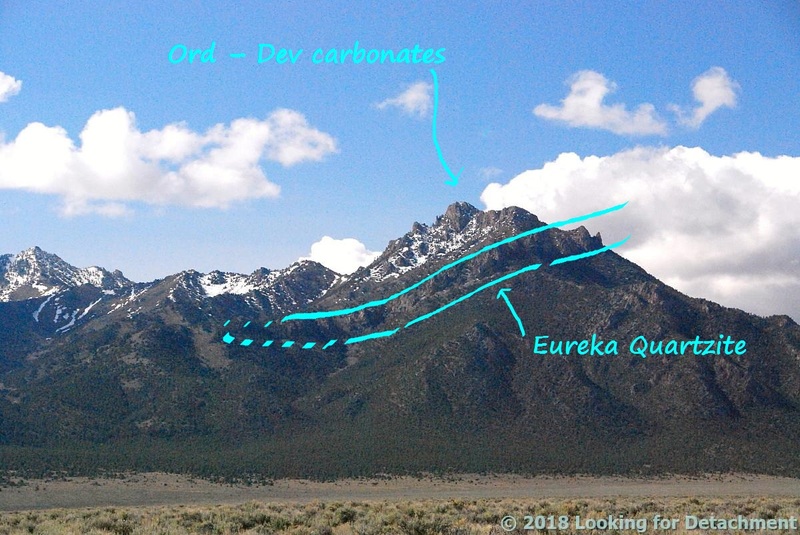 After crossing the spit coming northward off the elongate, dual-knobbed hill, we get a nice sideview of both knobs, looking south. 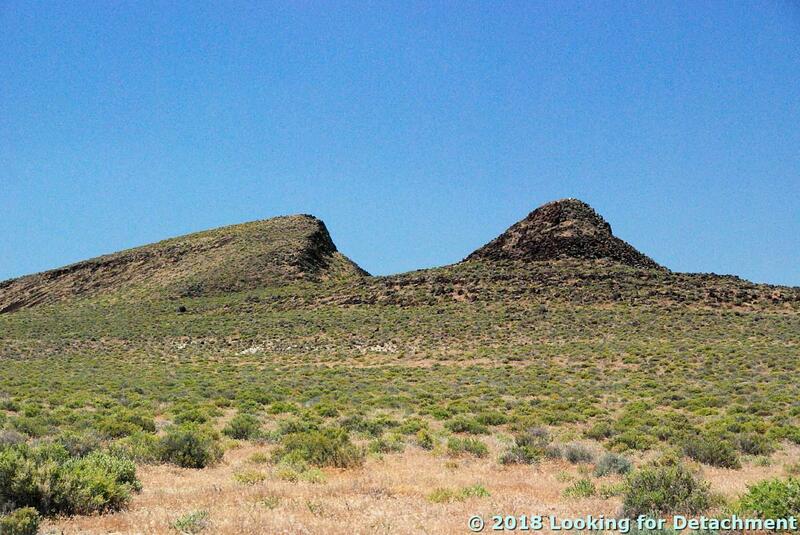 The far knob, which has the highest elevation, and which we can call Hill 1362 because it's labeled as such on the USGS topo map (the hill is 1362 m high), exposes some nice basalt columns, slightly tilted. And shorelines. The entire hill is encircled by shorelines. The tops of both of these knobs stuck up out of the highest stand of Lake Lahontan, which was at about 1334 m (4377 ft) in this area. Google Earth view of Hill 1362. 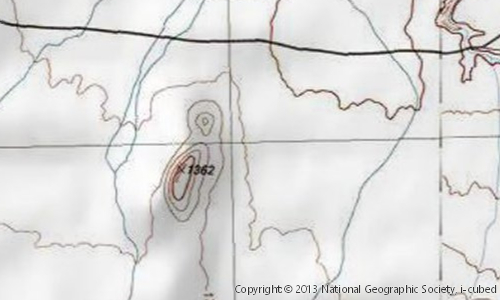 A USGS TNM Viewer map of approximately the same area. ...here’s what the elongate hill of two knobs looks like looking back to the east from a little farther down the Jungo Road. Perhaps much of the talus is composed of chunks of basalt columns. Next time I’ll stop and check. 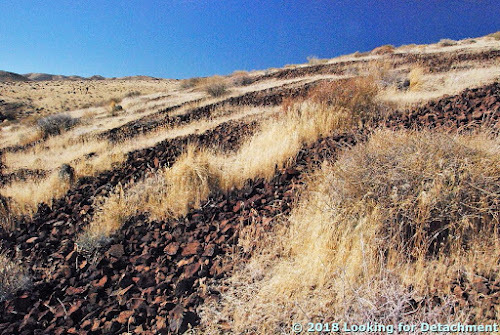 These photos of basalt and shorelines were taken on various trips I’ve taken on the Jungo Road. The first three are from 5/24/2007; the next, a browner, dryer picture, was taken 8/3/2012 in high summer; the last was taken 6/14/2006. We'll continue farther, on our mid-June, 2018, journey. About 2½ miles closer to Gerlach, I stopped and grabbed this photo of the Black Rock Desert, the playa shining in the sun. The hills on the left of the photo are low hills belonging to Pahsupp Mountain; the mountains in the farest distance are the main part of the Granite Range, which runs northward out of Gerlach. Numerous views can be had of the Black Rock Desert from Sulphur to Gerlach. Light and shadow change with the seasons and with the passing of clouds. Sometimes the playa is brightly lit, other times it’s in shadow, with the mountains around it glowing in sunlight. 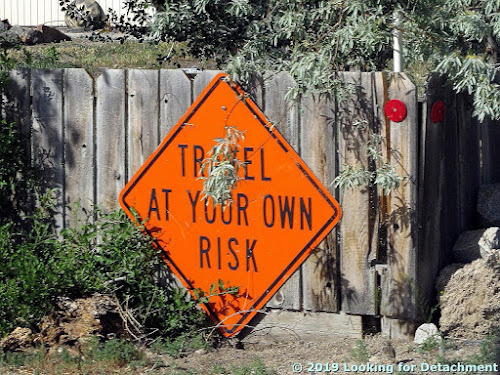 There are a few notable places to stop along the road, one being Trego Hot Springs and another being the Frog Pond (although it’s usually posted No Trespassing and the gate is usually locked). 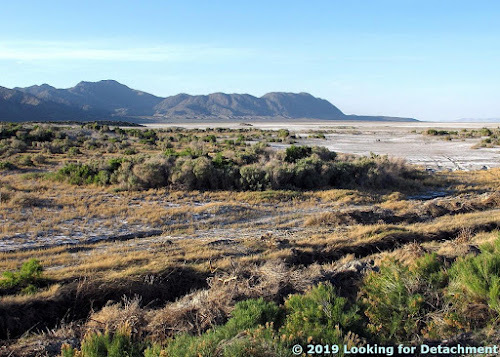 On this trip, I hurried past those spots and others, and declined to drive out onto the playa, as it looked like it might still be a little muddy from winter. Nearer to Gerlach, I pulled off on the side of the road, mostly for a pit stop, and also to see if I could find some Prince’s Plume. Alas, it was past the best blooming date. Not finding any Prince's Plume, I realized this was an excellent spot to take a photo looking more or less to the northeast, across the railroad tracks and across the desert toward the playa arm going up toward Soldier Meadow. The pinkish Calico Mountains are mostly in the sun just left of center, and the southern part of the Black Rock Range is mostly in shadow way over to the right. After a moment, I noticed a nearby lizard, who kindly didn’t run off while I took this photo. 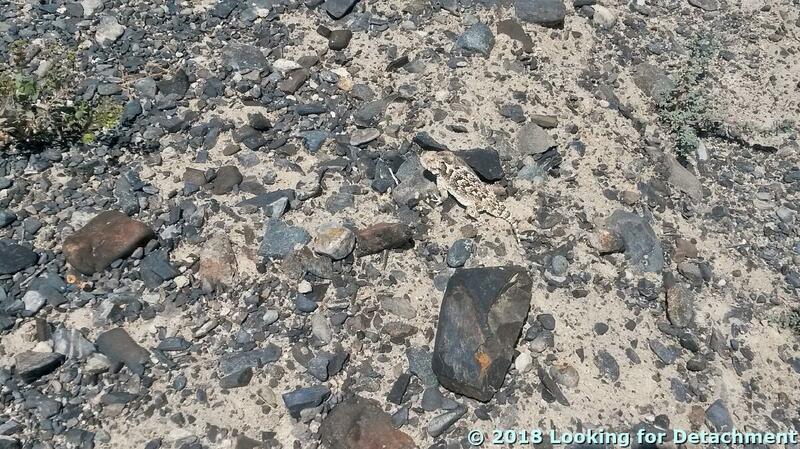 I’m a little surprised I saw it, camouflaged as it was amidst the patchy desert pavement. It was already getting late by this time—well, it was 2:30 pm, anyway—and I had miles and miles to go, so I drove through Gerlach without stopping, but only after doing a gas mileage calculation to make sure I would get to the next gas station, which would be almost 91 miles down the road, across another desert, up a creek, over a mountain, and down the other side. 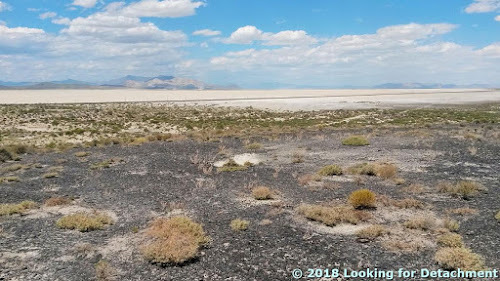 Nearly an hour later, after passing through Gerlach without stopping for ravioli or anything else, I made it to the northwest side of the Smoke Creek Desert and stopped to see if there was still any water in the playa. There had been quite a bit in the spring of 2017, just a little more than a year before this trek. Straining my eyes to see, I decided there wasn't any water, but I took this photo, thinking maybe I'd spot some water later. 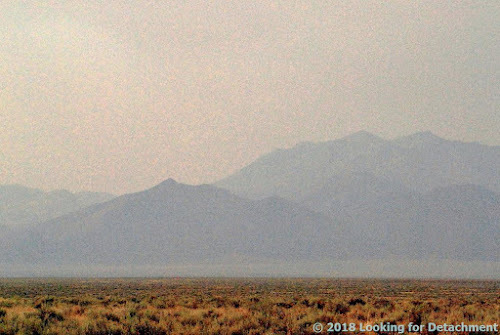 The desert does look little shiny near the center of the photo, in front of Pah-Rum Peak and a ridge of the Fox Range, but probably that’s just mirage. Toward the right of the photo, the playa is darkened by cloud shadows. Not much farther down the west side of the Smoke Creek, I pulled over for a quick examination of some tufa. 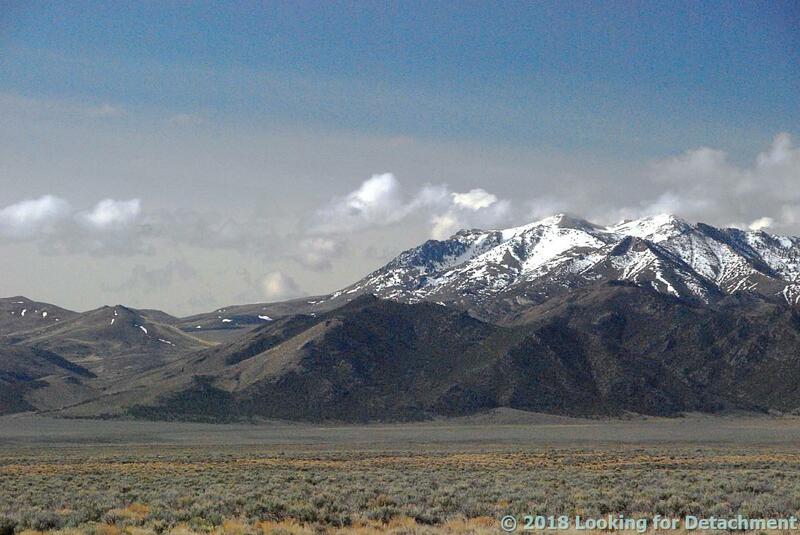 It was a fall day, and while driving out to my field site near Winnemucca I stopped for a hike. 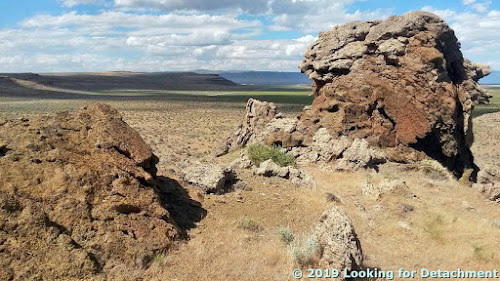 I got up high enough to see the water in the Humboldt Sink quite clearly (although way off in the distance), and I clambered over piles of talus. The tallish cheatgrass and possibly an ephedra bush are showing their fall colors, though the cheatgrass takes on this straw yellow color by mid June, and keeps showing it until it regenerates itself from seed sometime in the spring. And here I am, on top of part of the talus, with a great deal of foreshortening going on so the hill seems nearly flat, and the nicely filled but not overflowing Humboldt Sink is in the background. 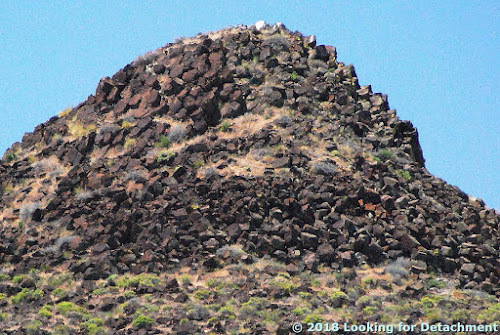 My Jeep can be seen as a vague dot between talus and lake about half way between the center and right of the photo and not far above the vertical center. Water in the desert is always a precious thing, and it's always something worth stopping for. 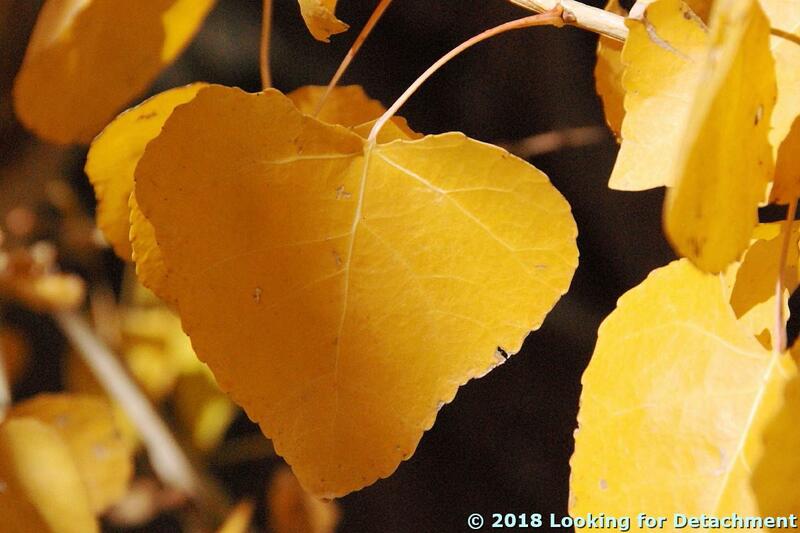 Somewhat unrelated: I stopped along the Truckee River before making it to that rocky perch above the Humboldt Sink and took a few photos of bright yellow leaves. These photo pairs of the Roberts Mountains were taken in early May and early August from not quite identical points along the Tonkin road in what amounts to the southern part of Pine Valley in north-central Nevada. Roberts Creek Mountain is the highest peak in the first photo pair. The rocky foreridge in the second photo pair is underlain by the Ordovician Eureka Quartzite, with various Ordovician through Devonian carbonate formations above the quartzite and various Cambrian through Ordovician formations below it. Yeah, it was quite smoky when I drove through last week — and probably still is — with this particular batch of smoke coming primarily from the Ferguson fire in Yosemite. Photos taken 1May2018 and 4Aug2018.